Habitat for Humanity of Miami County, Ohio, has officially changed its name to Habitat for Humanity of Miami & Shelby Counties, Ohio (HFHMSCO). The change was effective January 1, 2015. ﻿Nancy Davis, a Habitat homeowner and long-time volunteer, paid off her 20-year, zero interest mortgage with her last payment Tuesday, November 7, 2018. There was an amazing celebration in her honor. The journey has been such a rewarding one for her. ﻿﻿﻿Nancy told us the story of the living conditions she was in when she first started with Habitat. Her family was in an apartment. She and her husband at the time were the parents of two special needs children. Before Habitat built Nancy and her family a home, she was providing a bath for her older child in a kids’ pool in the kitchen. The only bathroom was upstairs and her oldest child's lack of mobility with her size made it impossible to carry her upstairs any longer. She never thought that they would be accepted by our selection committee. She feels so blessed and said her life has gotten so much better in her Habitat home. It feels really good to be able to help families like Nancy! TROY — Habitat for Humanity of Miami and Shelby Counties, Ohio (HFHMSCO) commemorated the opening of its new Habitat Activity Center (HAC) on Thursday, introducing a facility to the public that is one-of-a-kind in the state of Ohio. ﻿﻿﻿﻿﻿﻿The center’s location, based at 150 E. Race St., Troy, was made possible by the relocation of the ReStore in July 2016 to its current location on Dorset Road. It was deemed uneconomical to sell and relocate the Habitat for Humanity offices, which led to plans for the 5000 square feet of vacant space to be renovated into a climate-controlled community center for carpentry and woodwork. Renovations on the facility took 12 months, with an approximate cost of $80,000. A total of 91 volunteers donated 3,818 hours to the facility’s renovation. 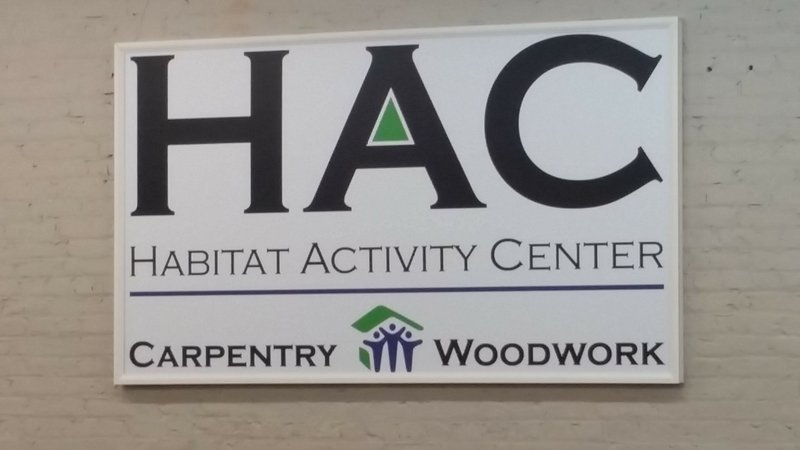 The Habitat Activity Center features a full shop of state-of-the-art woodworking equipment, along with newly furnished kitchen, conference, and classroom spaces, with equipment and furnishings provided by generous donors throughout Miami and Shelby counties. The facility will be used to benefit Habitat for Humanity’s Construction and Repair programs, as well as to support community carpentry and woodwork projects via an application submittal. Classroom and hands-on education and training programs will be conducted at the facility for Habitat families, non-profit organizations, and members of the public on topics related to home ownership, maintenance, safety, landscaping, energy use, and more. Habitat for Humanity of Miami and Shelby Counties is a faith-based organization seeking to provide residents access to quality and affordable homeownership opportunities. Habitat for Humanity International offers services to 1,400 communities and 70 countries worldwide, providing housing to over 10 million people annually. Habitat for Humanity of Miami and Shelby Counties, Ohio (HFHMSCO) is proud to announce the dedication of Kelly Beemer’s home on Sunday, September 23, 2018 at 1:30 PM at 524 Second Ave. Sidney, OH. Kelly has met Habitat’s criteria for homeownership of need, sweat equity, and assumption of a 20-year, zero interest mortgage. Her family and friends, along with volunteers from Emerson and Cargill, have completed the four-bedroom home. “We (Habitat) would like to thank all the volunteers from Emerson and Cargill, as well as, the many local contractors, suppliers and business who have contributed to the completion of this build. It never happens without strong local support” said William Horstman, Executive Director and COO. The public is invited to the dedication ceremonies. People in Miami and Shelby Counties, and all over the world, partner with Habitat for Humanity to build or improve a place they can call home. Habitat homeowners help build their own homes alongside volunteers and pay an affordable mortgage. With our help, Habitat homeowners achieve the strength, stability and independence they need to build a better life for themselves and their families. Everyone needs a foundation to build a future. Every home is a building block. Every home improvement gives children a better chance for a stronger future. Every donation helps a family help themselves. Every helping hand makes a difference. No matter who we are or where we come from, we all deserve to have a decent life. We deserve to feel strength and stability day after day. We deserve to know we have the power to take care of ourselves and build our own futures. At Habitat for Humanity, this is what unites us. Through shelter, we empower. Our shared vision is a world where everyone has a decent place to live. Because you, me, we — we’re all humans. And every single one of us deserves the opportunity for a better future. Jordan Erickson and Joel Lloyd, summer interns and Hobart, fabricated and welded six portable steel tables for a newly established Habitat Activity Center workshop on Race Street in Troy. Volunteer David Kinninger works on a woodworking project at one of the newly fabricated tables built in the 5,000-square-foot space is located at the Habitat for Humanity headquarters. The tables, designed by the Upper Valley Career Center in Piqua, will provide volunteers at the nonprofit with the space to build a variety of wood projects, such as picnic tables, chairs and porch swings. These products will be sold in the Habitat for Humanity ReStore home improvement outlet store, and proceeds will support the organization’s efforts to provide affordable and quality homes to residents in need. The tables took 60 hours to complete, and all materials were donated by Hobart. Volunteers with Habitat for Humanity finished the tables by adding wood tops and painting them. Kroger Community Rewards Program donates a percentage of your purchases to Habitat for Humanity of Miami and Shelby Counties. They have recently upgraded our Community Rewards system, and as a result, our Non-Profit Organization (NPO) has a new account number. Thank you for your continued support in partnering with Kroger for your local Habitat for Humanity fundraising efforts. While the previous number will continue to be associated with our organization, it will not be visible to our members when enrolling. New members can enroll by searching for either the new number or the name of our organization (Habitat for Humanity of Miami and Shelby Counties). Habitat for Humanity of Miami and Shelby Counties, Ohio (HFHMSCO) is proud to announce starting the construction of a home in early spring for homeowner Kelly Beemer’s family. Beemer’s four-bedroom home is being built on their chosen lot at 524 Second Ave. in Sidney, OH. The groundbreaking will take place on Sunday, April 29, 2018 @ 1:30 PM on site. The public is invited to the groundbreaking. Check out Habitat's updated website! It was a great day for a dedication of the Mullen family’s home in Jackson Center. We wish Kara, and her family all the best in their new home. 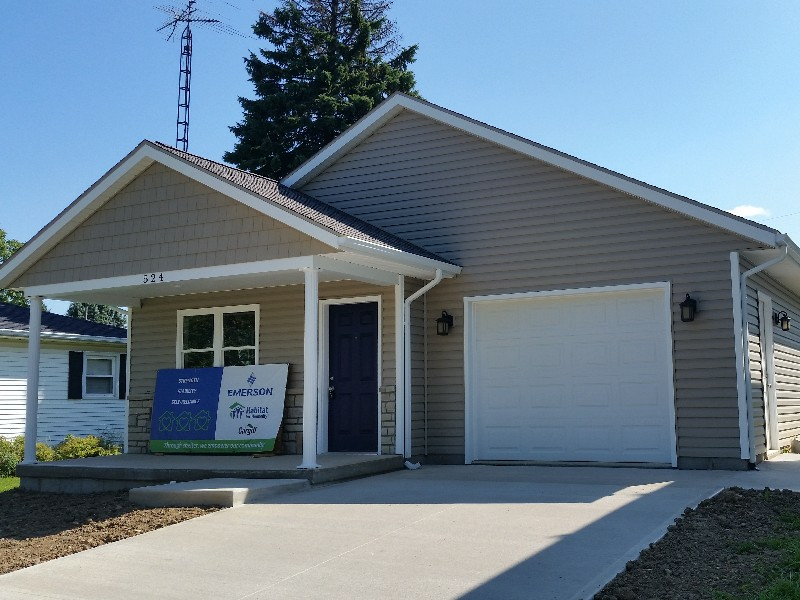 The following articles will bring you up-to-date on the build in Jackson Center, and provide some insight on the Habitat Homeowner Application process and Kara Mullen’s experience. Groundbreaking takes place for the Habitat build in Jackson Center. JACKSON CENTER — “It’s officially started.” Those words were spoken by William Horstman, Habitat for Humanity of Miami & Shelby Counties executive director Sunday afternoon. Habitat to start housing projects in Jackson Center and Troy. Join us for the groundbreakings! WHIO News report on Habitat’s ReStore serving Miami & Shelby Counties, OH. Habitat’s NEW ReStore is now OPEN. The Habitat ReStore located at 150 E. Race St., Troy, OH has permanently closed as of May 27, 2016. The NEW Habitat ReStore, located at 1490 W. Main St., Troy, OH will open approximately June 24, 2016. Donations will continue to be received [Monday – Friday 9am – 3pm in rear of building] during this period at the 1490 W. Main St. location. We appreciate your patience during this time of transition. VOLUNTEERS are need to assist in the transition and can report directly to the new location, or call 937-332-3763. We are recruiting volunteers for project activities Monday – Friday 9am – 5pm through July 2nd. “Live Generously” … the theme for the Thrivent sponsored Habitat repair project. Troy, OH, April 5, 2016 – Habitat for Humanity announced today that Airstream, Inc., makers of the iconic silver-bullet travel trailers, is sponsoring a Habitat “Build” in Jackson Center, Ohio. Airstream will provide $80,000 in sponsorship funding for the build, which is scheduled to take place later this year. In addition to providing financial support, Airstream will coordinate volunteer recruitment for the project and document the build with photography and video assets. Airstream will also provide public relations support and plan the groundbreaking and dedication ceremonies. People from Miami and Shelby County and all over the world partner with Habitat for Humanity to build or improve a place they can call home. Habitat homeowners help build their own homes alongside volunteers and pay an affordable mortgage. With our help, Habitat homeowners achieve the strength, stability and independence they need to build a better life for themselves and their families. Habitat has secured property for the “Build” in Jackson Center. Habitat is able to make homeownership affordable by offering mortgage loans with flexible terms and zero-interest or zero-equivalent, to low-to-moderate (LMI) families. Monthly payments are recycled back into the affiliate, which helps support the long-term sustainability of Habitat’s programs. Habitat is looking for a seasoned construction site-supervisor and knowledgeable group of three to five volunteers to serve as the on-site construction project management team for the “Build.” This team will be assisted by Habitat’s construction committee. Contact the Habitat office directly (937-332-3763) to become a member of the Shelby County Construction Team. Applications for housing are being accepted until June 1, 2016. The application form and cover letter are available at www.hfhmco.org. Please, print, complete and submit to the Habitat office. Airstream associates interested in applying for housing should contact their Human Resource department. Welcome our newest Board member and AmeriCorps/VISTA volunteer. We are also celebrating our 50th house build. Join us for the dedication. 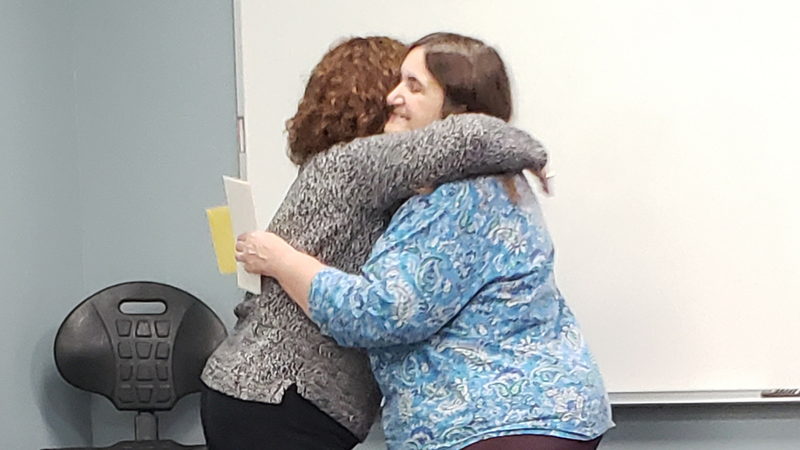 Judy Thompson, the Foundation’s Executive Director, presented the check to ReStore Manager Sharon McGill, to assist in the current efforts to relocate the Habitat ReStore to a “new” 17,000 square foot facility. “The VWK Foundation is pleased to support this effort. It is one of the largest awards the Foundation has made to an organization outside of Montgomery County,” said Thompson. Habitat for Humanity of Miami & Shelby Counties, OH (HFHMSCO) is pleased to announce the addition of three new board members … Dr. Reece Nickol, Mr. John Schweser and Mr. Seth Heckaman. Please join HFHMSCO in welcoming these three new board members who bring extensive experience and expertise to our Board. Dr. Reece Nickol is a native of Ohio and is currently a resident of Piqua. Married with four children and three grandchildren, Dr. Nickol received his education, post-graduate and medical school training in the Cincinnati-Dayton area, and retired from Miami County Surgeons/Upper Valley Professional Corporation in 2013. In addition to his full time career, he has actively volunteered in the community with such organizations as Big Brothers/Big Sisters; Habitat for Humanity; The Lehman High School Foundation Board, and recently was Chairman, Board of Directors of Upper Valley Medical Center. He brings over fifteen years of dedicated volunteerism to the HFHMSCO board. Mr. John Schweser has lived in Troy for the past 27 years; is married and has three grown children. His career path is in Management with Meijer stores, and he also brings a wealth of active community volunteerism to the board. Mr. Schweser is a Troy Soccer Parent member; past Secretary and current Treasurer for the Martin Luther King Team; past member of the board of the Troy Historical Society and currently in his fourth term on the Troy City Council, 3rd Ward. Also, the Troy Strawberry Festival has had the benefit of Mr. Schweser’s leadership abilities. Mr. Seth Heckaman serves as Sales Manager for Isaiah Industries, a leading manufacturer and distributor of premium, residential building products. He holds a BA in Organizational Management from Bluffton University, has volunteered with his local church and started a nonprofit to help raise awareness of human trafficking in the Miami Valley. Seth currently resides in Piqua with his wife and child. We are “working quietly” behind the scenes to broaden the reach of the Habitat mission. The following article captures the “major” businesses behind our strategic initiatives. Become part of an organization which is making a difference! Last fall the Board of Trustees for Habitat for Humanity of Miami County, OH (HFHMCO) approved to incorporate the assets of the dissolving Habitat affiliate in Shelby County. Last December the mortgage service for five Shelby County Partner Families was completed, as was the title transfer for five vacant lots. Currently we are processing the expansion of the Geographical Service Area (GSA) to include Shelby County. Over the past months we have initiated the “relationship building” with the Shelby County Commissioners, City of Sidney, Sidney Chamber of Commerce, Shelby County Regional Planning Commission, The Community Foundation of Shelby County, Shelby County Continuum of Care, and other nonprofit agencies and local businesses. We invite other Shelby County organizations; businesses and nonprofit agencies to contact us to explore future relationships. Jim McGarry is a University of Dayton Civil Engineering graduate. In 2012, after 22 years as the Miami County Sanitary Engineer, he retired. Jim is a member of the Troy Planning Commission, Troy Optimists, Troy Elks, Tipp STEAM Boosters, and a graduate of Leadership Troy. Like all of our board members, Jim is very involved in the community and has helped with the Troy Strawberry Festival, Troy Basketball Parents Association, St. Patrick’s parish, and St Teresa’s parish. In addition to Habitat, he is active in Troy Community Works, WACO Historical Airpark, Troy Main Street, Piqua Main Street, Lehman Science Fair, and several local businesses. Jim is married to his wife Linda, a retired librarian from Troy Schools, and has lived in Troy since 1974. They have two children, Christie and Patrick.